Product specific training can be delivered in a variety of ways. The options include product training manuals, online or mobile device training courses, group classroom-setting training either at the trainer’s facility or at your facility, or custom developed on-site training. The use of simple, straight forward products may be learned through product manuals, but for more complex products or systems, a more extensive training program is desirable. 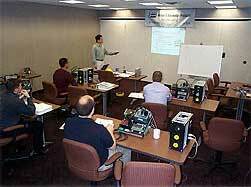 Technical training programs can be designed to suit your specific interests and needs. Each training program will be unique in its approach to learning product-specific motion control techniques from the experts. It can be advantageous to assess your training needs often as keeping your personnel’s’ knowledge and skills up-to-date can save you time and money.